Katsutoshi Miuzno from Nissan has just announced Nissans plans to run a version of the Nissan GT-R in the 24 Hours of Nurburgring, according to a link that MC from NAGTROC posted. 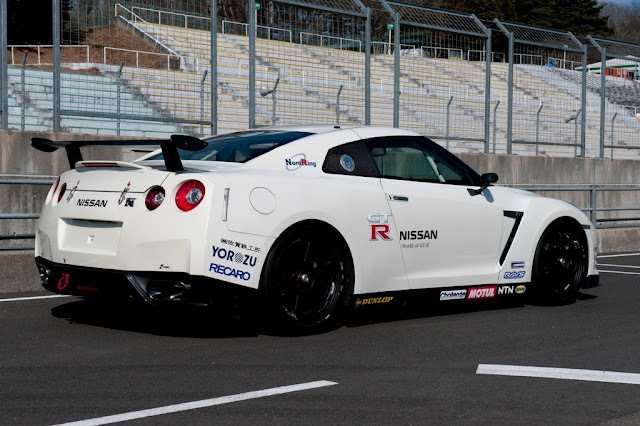 They say that the actual Nissan GT-R development team, not Nismo will be competing in the race. He says that for the last four years, they have been working on the car, and trying to prove its reliability for this 24 Hour race. (Hope they have a spare GR6 transmission, and lots of brake rotors). It says they are running a 10 inch wide front wheel vs a 9.5 stock, although it looks like the rear tire is very wide. They say they switched the calipers over to forged calipers, probably so they can fit more brake pad into the setup. The front wheels look to have a lot of caliper clearance, even more than the normal black edition wheel, Maybe its an optical illusion. Mizuno also alludes that we will see an updated/upgraded Nissan GT-R in 5 years. 2017 World, 2018 US? Check out the video and transcript below. Thanks to your support since its debut four years ago, the Nissan R35 GT-R has evolved to this level. To commemorate its fourth year, and looking to the future, we want to try something new this year. Let me explain. It's been four years since GT-R's debut. From the 2007 model's lap time of 7 minutes 38 seconds, this car achieves one lap of the Nordschleife in around 7 minutes 20 seconds. The GT-R will continue to evolve over the next five years or so in its current form, and continue to improve its performance. Just as important as performance improvement is, we must be confident about the reliability and durability of the car.This is the reason we chose to enter the 24 Hours Nürburgring: to perform harsher endurance tests for future performance improvements. In less time, more force is applied to the vehicle. To create such driving conditions we are participating in this 24-hour race. First of all, by completing the race, we will assure the car's durability and reliability. Secondly, the opportunity also allows us to grow as a team.I always say, the evolution of a vehicle also necessitates the evolution of the people that continue its development. If the people do not evolve, the car will not evolve.This is why the team will challenge itself to develop the ultimate car using the experience from the 24-hour race. As a result, each team member will create a theme and a course for the training required for further development. This is why we are taking on this challenge. All the fans are looking forward to watching GT-R, tested and evolved here in the Nürburgring, racing against strong competitors. We want to share the excitement with them.To accomplish this, we have been planning to have the GT-R compete in a 24-hour race since 2007. Not through Nismo, the motorsports and racing division of Nissan, but the actual GT-R development team. In competing, I hope we will respond to the expectations of the car, the team's own expectations, and the expectations of the fans. Let me tell you a bit about the details of this GT-R's specifications. Because we must consider the reliability and durability aspects to be reflected in the car over the next five years, the engine, transmission and suspension are all standard specifications.They have to be the standard specification. 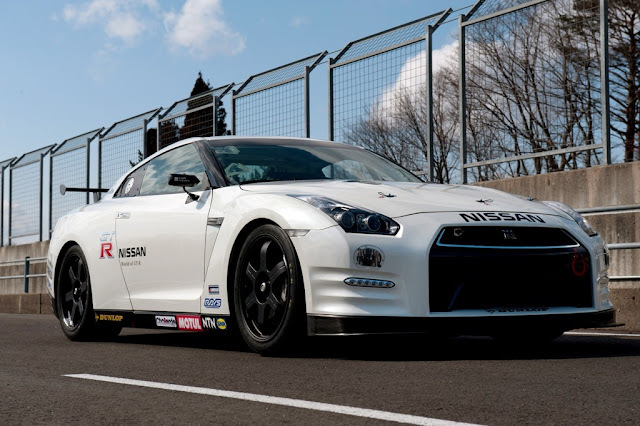 GT-R already has a package dedicated to circuit driving, the Club Track edition. The changes were made only to the mechanism, in anticipation of future performance improvements, and minimal modifications were made to meet the regulations of the 24-hour race. The details of the modifications were to increase the front downforce and slightly improve the aerodynamics of the front end. The engine is standard specification. The suspension is also standard, but the width of the wheels has been increased from 9.5J to 10J, and the rigidity of the suspension was increased. The interior is basically the same as the Club Track edition. Roll bars and the gas tank were modified to meet the regulations of the 24-hour race. The capacity of the gas tank, in particular, has been increased to 120 liters. For the rear, from an aerodynamics standpoint, the production model rear wing was replaced.These aerodynamic parts will no doubt be reflected in GT-Rs of the future. New high capacity brakes were chosen that are made with forged caliper metals. The basic specifications are the same as the Club Track edition. People ask me, "what is the ultimate performance goal of the GT-R?" There is no such thing. Because no matter what kind of GT-R I create this year, the customer who purchases it will say a year later: I want more power, more cornering capability, better brakes, a car that's more fun to drive. So if someone asks what our goal is, I will answer that it is not the performance of the car itself, but it is about our customers' feelings and expectations for the GT-R.
That is our development goal.As long as we are in the race, we will do our absolute best. 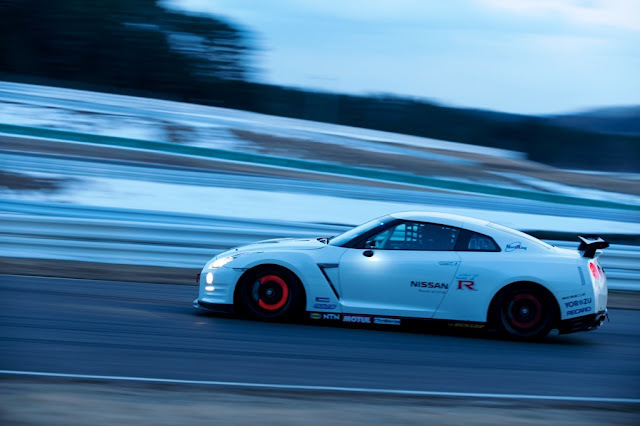 Our hope is that this race is a prelude to the GT-R that people will see five years from now.